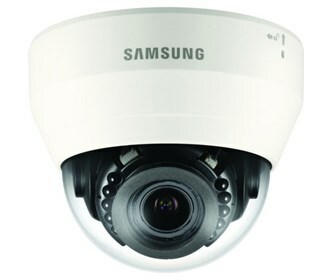 The Samsung B2B QND-7080R is a indoor dome network camera. This camera is equipped with a 4.3x V/F lens for precise monitoring. A minimum illumination of 0.15Lux (Color) makes the camera suitable for nighttime surveillance. Featuring a Day & Night function which gives crystal-clear image quality under any lighting conditions. It has Samsung Super Noise Reduction (SSNR), which offers color images in dimly-lit areas with reduced noise in the picture, thereby saving storage space. This camera comes with outstanding features like Tamper-detection, Automatic White Balance, Back Light Compensation, Lens Distortion Correction , Motion Detection Technology. Automatic gain control adjusts the signal strength to maintain a constant brightness level, and auto white balance adjusts the red and blue signals by taking a standard white color reference to get the most natural colors. The Samsung B2B QND-7080R has many exciting features for users of all types. The Samsung B2B QND-7080R is sold as a Brand New Unopened Item.